MGM Medical College, Navi Mumbai, India. Santosh Medical College, Ghaziabad, India. Government Medical College, Bhavnagar, India. Alzheimer’s disease (AD) is a chronic and slowly progressing neurodegenerative disorder which has become a major health concern worldwide. The literature has shown that oxidative stress is one of the most important risk factors behind the cause of AD. Oxidative stress often leads to the production of Reactive Oxygen Species (ROS). 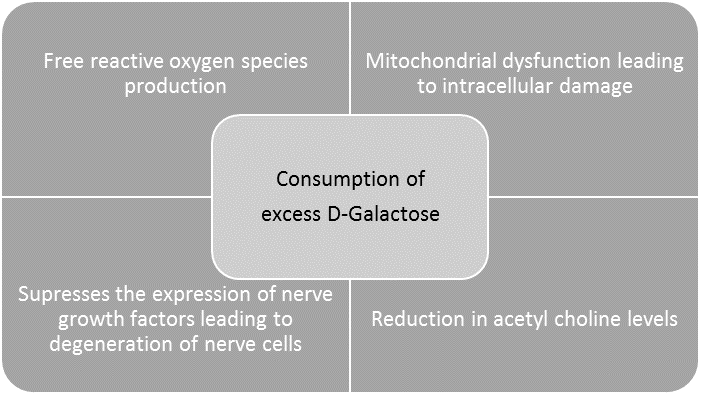 D-Galactose, a physiological nutrient and reducing sugar, non-enzymatically reacts with amines of amino acids in proteins and peptides to form Advanced Glycation End products which activate its receptors coupled to Biochemical pathways that stimulate free radical production and induces mitochondrial dysfunction which damages the neuron intracellularly. High dosage of D-Galactose also suppresses the expression of nerve growth factors and its associated protein which results in the degeneration of nerve cells and reduction of acetylcholine levels in brain regions. This article put forwards the advantages of using Lactic Acid Bacteria (Probiotics) possessing anti-oxidant properties and which produces Acetyl Choline against D-Galactose induced Alzheimer’s disease. 1. Alzheimer's and Dementia in India. Available from: http://www.alz.org/in/dementia-alzheimers-en.asp. Accessed on 3rd March, 2017. 2. Changing the Trajectory of Alzheimer's Disease. Available from: http://www.alz.org/alzheimers_disease_trajectory.asp. Accessed on 3rd March, 2017. 3. Sperling RA, Aisen PS, Beckett LA, Bennett DA, Craft S, Fagan AM, Iwatsubo T, Jack CR, Kaye J, Montine TJ, Park DC. Toward defining the preclinical stages of Alzheimer’s disease: Recommendations from the National Institute on Aging-Alzheimer's Association workgroups on diagnostic guidelines for Alzheimer's disease. Alzheimer's & dementia. 2011 May 31;7(3):280-92. 4. Mattson MP. Pathways towards and away from Alzheimer's disease. Nature. 2004 Aug 5;430(7000):631-9. 5. Bubici C, Papa S, Dean K, Franzoso G. 2006. Mutual crosstalk between reactive oxygen species and nuclear factorkappa B: molecular basis and biological significance. Oncogene 25: 6731-6748. 6. Chapple IL. 1997. Reactive oxygen species and antioxidants in inflammatory diseases. J. Clin. Periodontol. 24: 287-296. 7. Yu BP, Yang R. 1996. Critical evaluation of the free radical theory of aging. Ann. NY Acad. Sci. 786: 1-11. 8. Butterfield DA, Reed T, Newman SF, Sultana R. Roles of amyloid β-peptide-associated oxidative stress and brain protein modifications in the pathogenesis of Alzheimer's disease and mild cognitive impairment. Free Radical Biology and Medicine. 2007 Sep 1;43(5):658-77. 9. Lei M, Su Y, Hua X, Ding J, Han Q, Hu G, et al. Chronic systemic injection of D-galactose impairs the septohippocampal cholinergic system in rats. Neuroreport. 2008; 19: 1611-1615. 10. Ho S, Liu J, Wu R. Establishment of the mimetic aging effect in mice caused by D-galactose. Biogerontology 2003;4:15e8. 11. Lei M, Hua X, Xiao M, Ding J, Han Q, Hu G. Impairments of astrocytes are involved in the d-galactose-induced brain aging. Biochem Biophys Res Commun 2008;369:1082e7. 12. Zhang Z, Fan S, Zheng Y, Lu J, Wu D, Shan Q, et al. Purple sweet potato color attenuates oxidative stress and inflammatory response induced by d-galactose in mouse liver. Food Chem Toxicol 2009;47:496e501. 13. Woo JY, Gu W, Kim KA, Jang SE, Han MJ, Kim DH. Lactobacillus pentosus var. plantarum C29 ameliorates memory impairment and inflammaging in a D-galactose-induced accelerated aging mouse model. Anaerobe. 2014 Jun 30;27:22-6. 14. Gill R, Tsung A, Billiar T. Linking oxidative stress to inflammation: toll-like receptors. Free Radic Biol Med 2010;48:1121e32. 15. Yoo DY, Kim W, Lee CH, Shin BN, Nam SM, Choi JH, et al. Melatonin improves D-galactose-induced aging effects on behavior, neurogenesis, and lipid peroxidation in the mouse dentate gyrus via increasing pCREB expression. J Pineal Res 2012;52:21e8. 16. Bernardeau M, Vernoux JP, Henri-Dubernet S, Guéguen M. Safety assessment of dairy microorganisms: The Lactobacillus genus. Int J Food Microbiol 2008;126(3):278-85. 17. Islam MS, Choi H. Antidiabetic effect of Korean traditional Baechu (Chinese cabbage) kimchi in a type 2 diabetes model of rats. J Med Food 2009;12:292-7. 18. Jung IH, Jung MA, Kim EJ, Hem MJ, Kim DH. Lactobacillus pentosus var. plantarum C29 protects scopolamine induced memory deficit in mice. J Appl Microbiol 2012;113:1498-506. 19. Peng X, Meng J, Chi T, Liu P, Man C, Liu S, et al. Lactobacillus plantarum NDC 75017 alleviates the learning and memory ability in aging rats by reducing mitochindraildysfunction. Exp Ther Med 2014; 8: 1841-6. doi:10.3892/etm.2014.2000. 20. Hanish Singh JC, Alagarsamy V, Diwan PV, Sathesh Kumar S, Nisha JC, Narsimha Reddy Y. Neuroprotective effect of Alpiniagalanga (L.) fractions on Abeta(25-35) induced amnesia in mice. J Ethnopharmacol 2011;138(1):85-91. doi: 10.1016/jep.2011.08.048. 21. Girvin GT, Stevenson JW. Cell free" choline acetylase" from Lactobacillus plantarum. Canadian journal of biochemistry and physiology. 1954 Mar 1;32(2):131-46. 22. Cui X, Zuo P, Zhang Q, Li X, Hu Y, Long J, Packer L, Liu J. Chronic systemic D‐galactose exposure induces memory loss, neurodegeneration, and oxidative damage in mice: Protective effects of R‐α‐lipoic acid. Journal of neuroscience research. 2006 Jun 1;83(8):1584-90. 23. Stephenson M, Rowatt E, Harrison K. The production of acetylcholine by a strain of Lactobacillus plantarum. Microbiology. 1947 Sep 1;1(3):279-98. 24. Lane RM, Potkin SG, Enz A. Targeting acetylcholinesterase and butyrylcholinesterase in dementia. International Journal of Neuropsychopharmacology. 2006 Feb 1;9(1):101-24. 25. Yi ZJ, Fu YR, Li M, Gao KS, Zhang XG. Effect of LTA isolated from bifidobacteria on d-galactose-induced aging. Experimental gerontology. 2009 Dec 31;44(12):760-5. 26. Mallikarjuna N, Praveen K, Yellamma K. Role of Lactobacillus plantarum MTCC1325 in membrane-bound transport ATPases system in Alzheimer’s disease-induced rat brain. Bioimpacts. 2016;6(4):203-209. 27. Zhang WW, Sun QX, Liu YH, Gao W, Li YH, Lu K, Wang Z. Chronic administration of Liu Wei Dihuang protects rat's brain against D-galactose-induced impairment of cholinergic system. Sheng li xue bao:[Acta physiologica Sinica]. 2011 Jun;63(3):245-55. 28. Liu X, Cao S, Zhang X. Modulation of gut microbiota–brain axis by probiotics, prebiotics, and diet. Journal of agricultural and food chemistry. 2015 Sep 1;63(36):7885-95. 29. Lyte M. Microbial endocrinology and nutrition: a perspective on new mechanisms by which diet can influence gut-to-brain communication. PharmaNutrition. 2013 Jan 31;1(1):35-9. 30. Wood JD. Entericneuroimmunophysiology and pathophysiology. Gastroenterol. 2004;127:635-657. 31. Bravo JA, Forsythe P, Chew MV, Escaravage E, Savignac HM, Dinan TG, Bienenstock J, Cryan JF. Ingestion of Lactobacillus strain regulates emotional behavior and central GABA receptor expression in a mouse via the vagus nerve. Proceedings of the National Academy of Sciences. 2011 Sep 20;108(38):16050-5. Varshil Mehta, Kavya Bhatt, Nimit Desai, Mansi Naik, 2017.